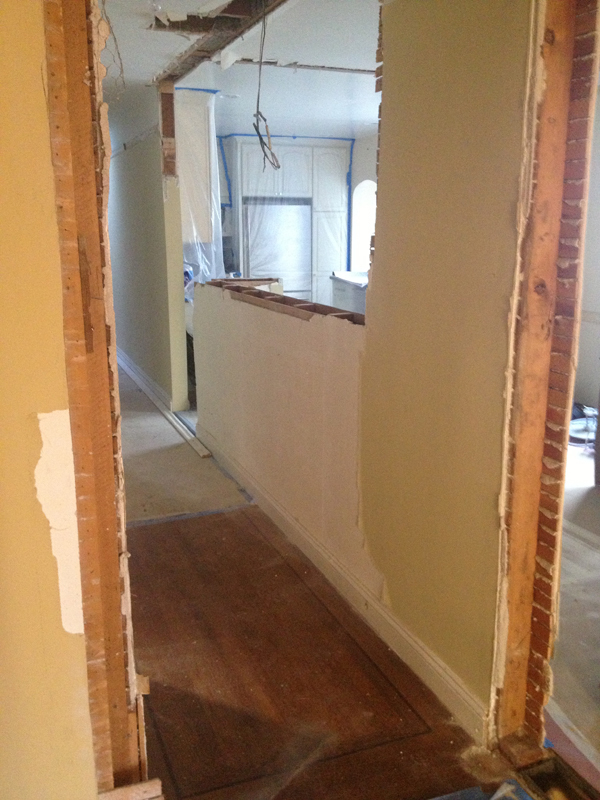 at the castro corner house, the new walls were framed in, and sheetrock is now being installed. above is the rough framed new stair to the first floor. about 20′ of new concrete retaining wall was poured along the property line. 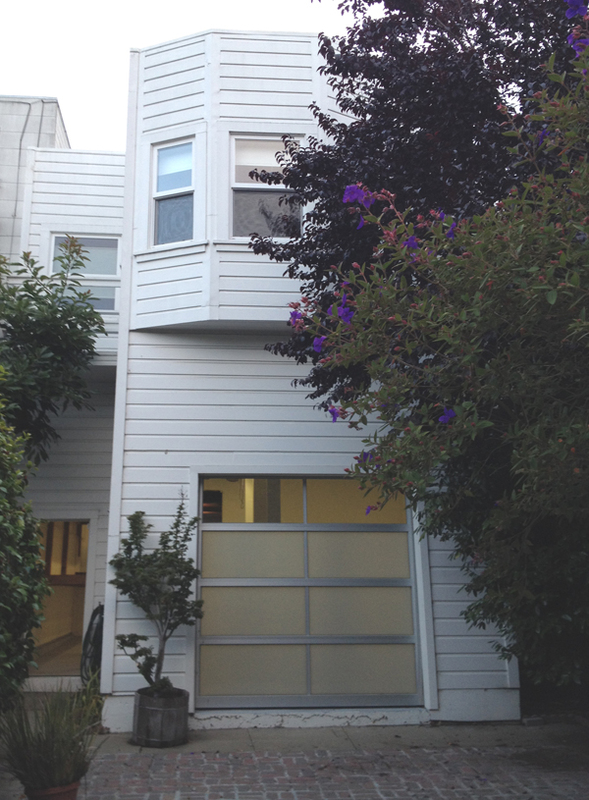 in the photo above, part of the concrete wall is thinner to allow for the stair landing in this location – every inch counts to make the stairs work, especially in these narrow san francisco lots! here the 6′ tall new concrete is furred out to allow for bathroom plumbing to run inside. new johns-manville formaldehyde-free insulation (for better indoor air quality) fills the wall cavities where there was no insulation before…..the globe is warming but we’re using more insulation now than we did in 1940. 🙂 from this point looking over the new stairwell you can see through the lower hallway and to the new garden door. a nice peek to the rear yard without having to go downstairs.. a view along the floor toward the new built-in bench, and spot where the gas fireplace will go. it’s a corner fireplace by Ortal. pretty slick! can’t wait to see it. we’re further along than these pictures show; some cabinetry is installed, and we’re selecting final finishes now. stay tuned, more to come! 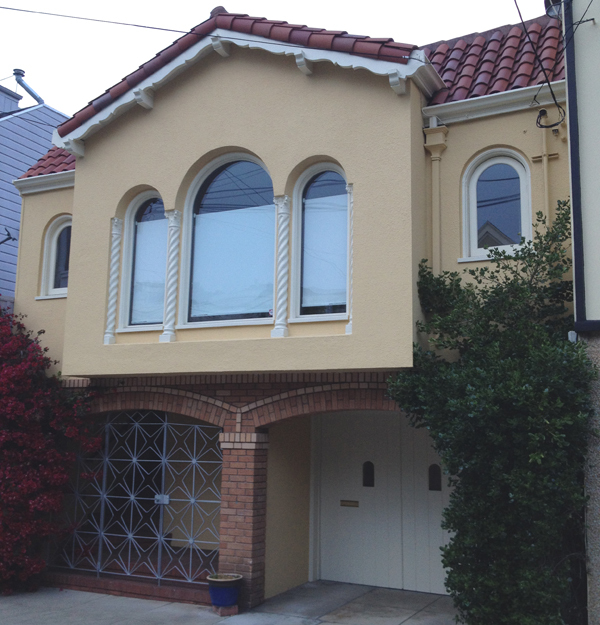 here’s a house at the bottom of a steep block, built in 1940, slathered in stucco with red tile accents. 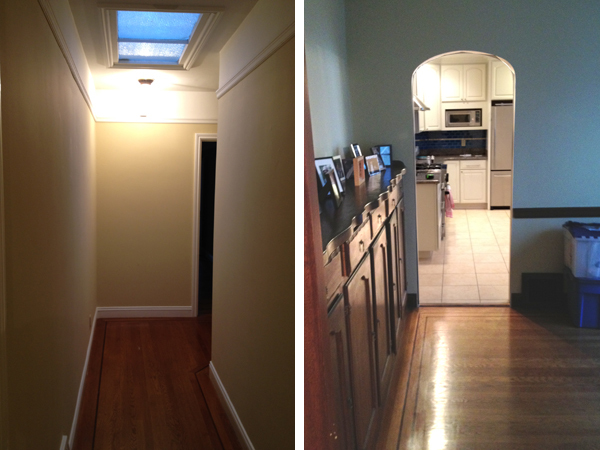 below are some interior views while it was for sale. it’s not unlike my own apartment: a house of redundant doors, disconnected rooms, box by box by box. 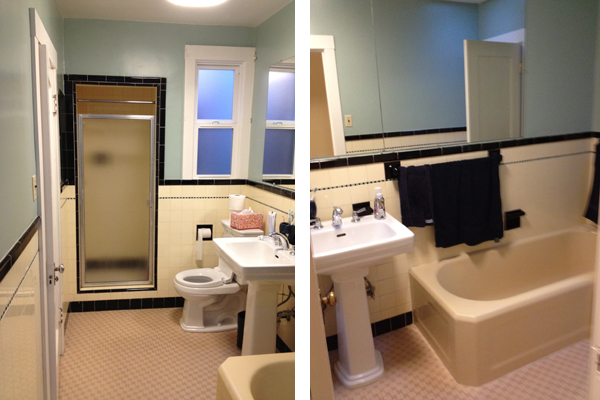 my friend andrew, a realtor, introduced me to the new owners and we discussed a two-phase, or a minimal-change remodel. “let’s keep the kitchen cabinets” “we don’t want to do the downstairs until a couple of years from now”… these initial ideas have a funny way of mushrooming, and next thing you know we’re doing the entire project at once, down to the studs! the more they opened and closed the flimsy cabinets, and stared at the corner toilet (I don’t think I’ve seen that before..) they realized it all had to go. closed-off rooms is not the way most people prefer to live now; the majority of our clients want connected spaces to spend more time together. it’s less formal, but also a factor of our lives being so busy that when we’re at home we want to see each other and connect! or, watch tv while cooking spaghetti. 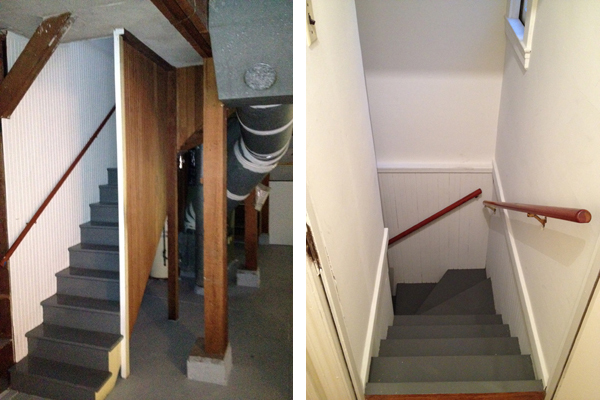 below is the first floor garage / basement, all one huge space with no rooms or use other than laundry and storage. a narrow winding staircase connected the two levels. it was convenient to see the framing, plumbing, etc exposed on this level; for making structural estimates and knowing where everything is running. time for demo! in san francisco where codes and rules are as plentiful and convoluted as the hazy hash smoke wafting through the streets, we have to be careful about how much of the house we demo – even inside. when I try to explain this to people they give me the most confused reactions and a huge WHY? I share their wonder – I understand the desire to retain some worthy building exteriors, but inside, homeowners should be able to live and revise how they want to. 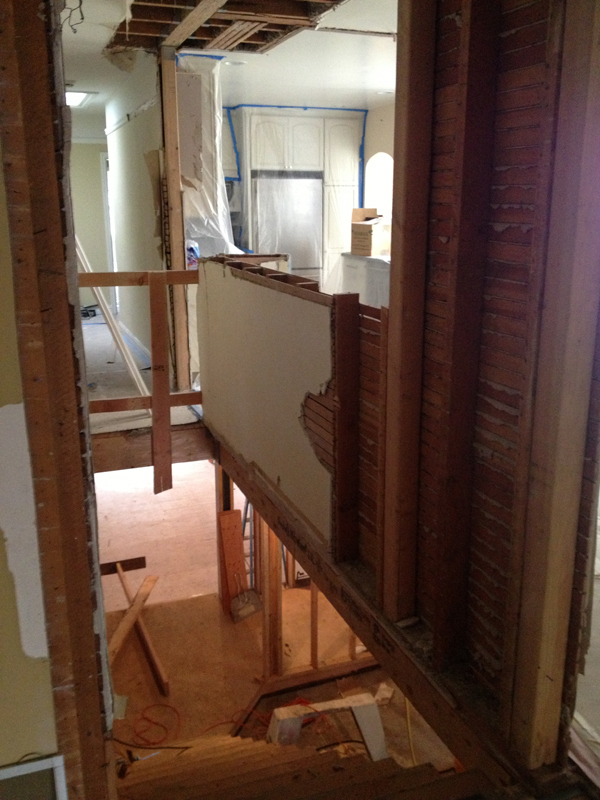 we’re excavating at the first floor because the ceiling wasn’t high enough for living spaces (bedrooms). we’re going down a total of about 24″. the hulking wood posts & beams, original to the house, will be reused somehow inside – barn door? shelving? check this out below, found under the slab in the dirt: WHAT IS IT?? it’s made of leather, feathers, some paint. it looks so well-preserved it’s hard to imagine it was in the dirt since 1940 when the house was built. it’s about 24″ long x 13″ at the widest. a mask, or a shield? indian, or african? we also found a red rubber bouncy ball. weird. I love when we find stuff in the walls or below in the dirt – this is certainly unique. one friend suggested it may indicate burial and that we could find bones if we dug deeper; but I can’t imagine that this block of comparatively young houses for this neighborhood, is atop a burial ground unknown at the time of construction. any ideas? more to come! This otherwise ‘Marina-style’ house had some art-deco reminiscent details in it so that’s what I’m calling it. (marina-style typically has a garage and unfinished basement area at ground level with the living space on the second floor.) Look at the front: we didn’t make any changes here, I really wouldn’t know what to do without ripping off those tiles – or paint them charcoal grey – is that possible? My clients said that in their search for a home they liked yellow houses because they look happy – I like that thought! The house had a few challenges, one was the redundant circulation seen above – you could walk down a hallway or take a parallel route through adjacent rooms to get to the bedrooms and bathroom at the back. Second, the only bathroom was big enough to be split into two (it had that typical low-ceilinged shower stall) Third, the stair was narrow and wound down into the garage. You had to walk through the garage to get to the tall basement space at the back. The previous owner installed a garage door to the yard which I liked, but we ended up redesigning with non-garage doors. The new owners wanted a better connection between floors, a finished usable first floor, master bath and new guest bath downstairs. I thought, who needs two hallways? 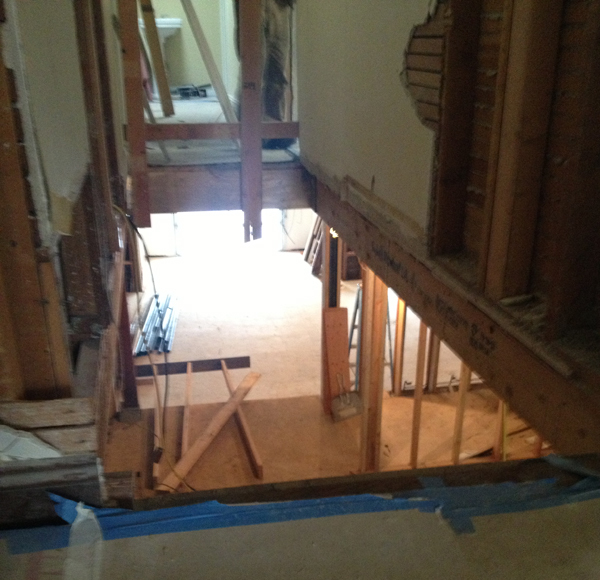 and decided to drop the new stair directly down through the hallway floor. 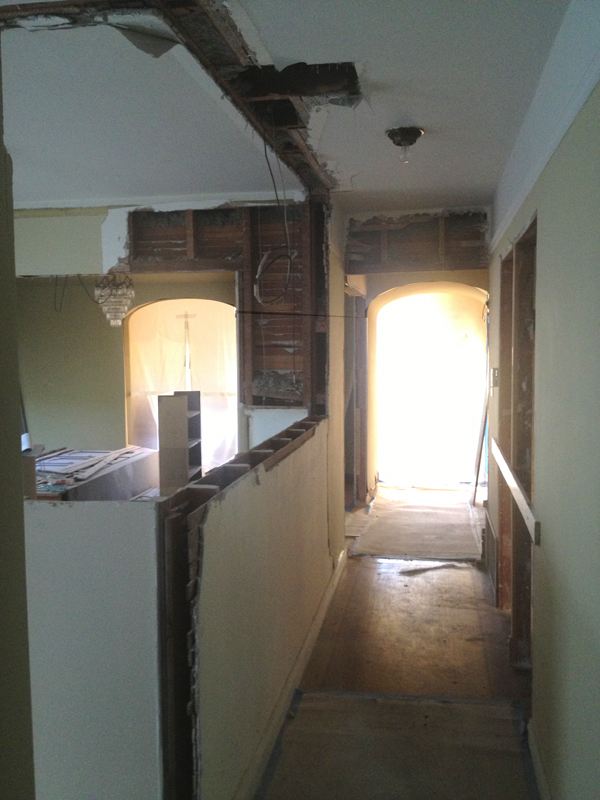 Here’s a view of the hallway, with the other rooms to the side after we opened up the wall. 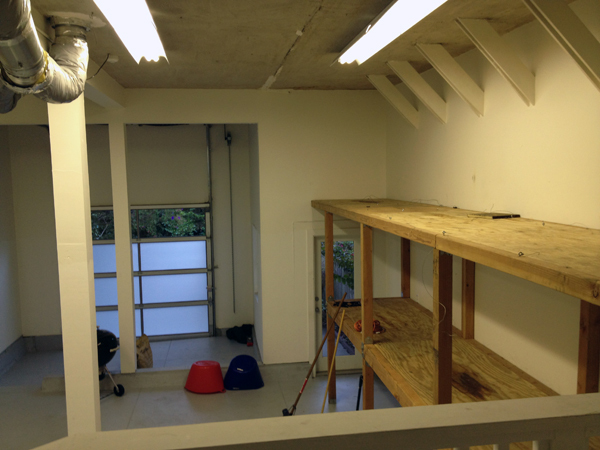 A view from the other end – – and then right after the floor was cut out and the new stair put in. Voila! Direct connection down with comfortable stairs, opened rooms and finishing out the first floor…still in progress.. A view down to the lower floor to see the light coming in from the back yard. Stay tuned, more to come!